When you stay at The Cottages at North Beach Plantation in North Myrtle Beach, you'll be on the beach, within a 5-minute drive of Barefoot Landing and Alabama Theatre. This beach resort is 10.5 mi (17 km) from Ripley's Aquarium and 10.9 mi (17.5 km) from Broadway at the Beach. Make yourself at home in one of the 100 air-conditioned rooms featuring kitchens with refrigerators and ovens. Complimentary wireless Internet access keeps you connected, and 36-inch flat-screen televisions are provided for your entertainment. Conveniences include coffee/tea makers and irons/ironing boards, as well as phones with free local calls. Pamper yourself with a visit to the spa, which offers massages and facials. You're sure to appreciate the recreational amenities, which include 5 outdoor swimming pools, 5 spa tubs, and a lazy river. This resort also features complimentary wireless Internet access, concierge services, and a banquet hall. At The Cottages at North Beach Plantation, enjoy a satisfying meal at the restaurant. Unwind at the end of the day with a drink at the bar/lounge or the swim-up bar. Buffet breakfasts are available daily from 7 AM to 8:30 AM for a fee. Featured amenities include a business center, a 24-hour front desk, and an elevator (lift). 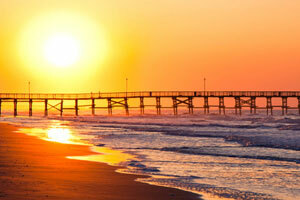 The preferred airport for The Cottages at North Beach Plantation is Myrtle Beach, SC (MYR).